(continued from page 2 ) kinds of lumber and building material at their place. The yard is under the management of W. C. McCune, an indomitable hustler and they enjoy a large portion of the trade in their line. The Foster yard has earned a reputation for a superior grade of lumber, and people who buy of them are always well pleased with their purchase. They are sure to get the grades figured on and the figures are always low considering the high quality of the material which they handle. 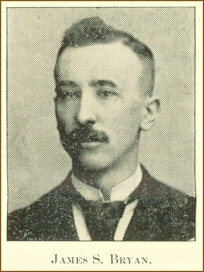 W. T. Smith is one of the energetic citizens of Perry who has the essential qualities of citizenship in the building up and development of a new country. He came here at the opening from Paola, Kansas, brought a car load of ice with him and was for sometime engaged in the ice business. He is now acting in the capacity of jailor for Noble county and has proven himself a careful pains-taking official, watchful of his duty. While there have been a number of attempts at jail breaking, none have succeeded under his administration. 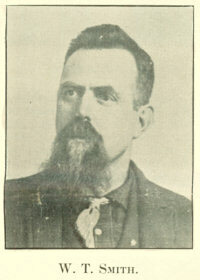 Mr. Smith is a native of the Hoosier state and was born in Fountain county, Oct. 28, 1844. His parents moved to Iowa in 1849, and from there to Kansas in 1857, where he resided until the opening of this country, twenty years of which time he lived at the town of Paola. Mr. Smith has raised a family of eleven children, all of whom are now living at home. He is very proud of his family and indeed has a right to be. He served during the late unpleasantness as a private of company E., 11th K. V. C., and gets a great deal of pleasure from the associations of his old comrades. Frank Ireland, the genial host of the Blue Point restaurant, keeps a neat place for supplying the inner man. The best of everything to be had is served by clean waiters and prepared by experienced cooks. Fresh oysters, fish and game in season. A good square meal is put up at a low price, and the thousands who have eaten at this place will testify to its merits. Anything can he had on short order and the place is kept open day and night. The Blue Point is south of the land office. The business men of Perry afford a number of illustrations of energetic men who have begun with comparatively nothing in this city, and in the short interval of time, or four years, have become comfortably well-to-do. B. Liebenheim, the Merchant Tailor, belongs to the above. Mr. Liebenheim is of foreign decent, being a native of Austria-Hungary, where he was born in 1859. He began his trade in his thirteenth year, and seven years later joined the Hungarian Cavalry, serving in the capacity of sergeant for six years. 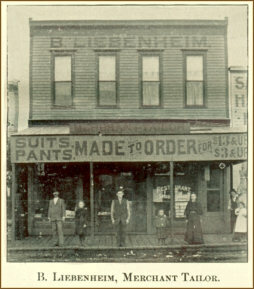 Upon leaving the army Mr. Liebenheim came to New York City where he worked at his trade for a year and was enabled to engage in business for himself in the great metropolis. He went from there to Bridgeport, Conn., where he remained a year. At the opening of Oklahoma proper he located at Guthrie. He made the run later into the Sac and Fox country, securing a valuable quarter section one mile and a half from Chandler. He resided there and improved his farm until the opening of this country when he came to Perry. He opened business here without capital and now has one of the best business houses and lot on the south side and a fine stock of merchant tailoring goods. He still owns the farm in Lincoln Co. Mr. Liebenheim understands his business thoroughly and enjoys a large trade. The Good Luck Millinery Store. 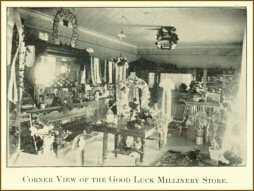 The above illustration shows one corner in the Good Luck Millinery Store. Mrs. Williams, in the short space of two years, has carved her way to success and her establishment is known as one of the most complete in Oklahoma. This lady combines tact and business ability with a knowledge of her line of goods possessed by an artist. She visits the great millinery centers twice a year and in person select the goods suitable to her trade. She carries the novelties not generally introduced in a town of this size but she has educated her trade up to that point where the latest and best goods in the market sell readily. The Good Luck Millinery Store is a credit to Perry and to the enterprise and genius of the lady who is at the head of the establishment. The business of this firm has grown from a modest beginning during the earley (sic) days to one of the largest grocery houses in the city. They now handle a wholesale and retail trade and their reputation as a strictly reliable low priced house extends into the adjoining country. Their business house fronts on Sixth street and extends along C. It is known as the busy corner and the streets and sidewalks are always crowded with people who have produce to sell and goods to buy. This firm have recently added a large addition to their store and the interior contains everything in the grocery line carried in a first-class grocery house. They keep their old customers by satisfactory business methods and are constantly adding new ones with the advantageous facilities which they possess for carrying on a large business. The great plant of the Anheuser-Busch Brewing Association is represented here by that prince of good fellows and business men, Jas. S. Bryan. Everyone knows the brewery to be America's greatest establishment of the kind, while its products and cooling beverages are enjoyed and relished in nearly every clime (sic). The subject of this sketch, Jas. S. Bryan, was born and reared in Missouri, and has been identified with Oklahoma for the past five years, during which time he has represented the same old reliable concern, first at Norman and various other points, coming to Perry where he established a cold storage and ware house shortly after the opening. He is the owner of a fine claim five miles northwest of Perry, and is a permanent citizen of Noble county. Through the popularity of the beer and that of the irrepressible Bryan, they supply the best of the trade in this section. Mr. Bryan is popular, brim full of enterprise and a live business man, a good citizen and a true exponent of the excellent qualities of those famous brews, Budweiser. Tony Faust and the celebrated keg beer, of which, during the past year, he has sold, in Perry, sixty carloads, and which place he regards as one of the best points in Oklahoma. This is the proper place to secure a clean shave, neat hear cut and comfortable bath. The genial Dock Gullage is the propietor and he leaves nothing undone that will add to the comfort and convenience of his patrons. The best of barbers are employed and they will not talk you to death while you are being shaved. The razors are sharp, towels clean and artists touch light. Those who once patronize this place always become regular	patrons. Go and see them. South side of the square.